Most Thursday Night Hikes are in the Twin Cities metro area. They vary from park and nature preserve trails through to urban neighborhood sidewalks. Below are upcoming hikes followed by a link to some of our other popular Twin Cities hikes. We’re always adding new hikes so check back often or follow us to get an email (see FOLLOW US at bottom of page). More of our hikes can be found over on our POSTS page using the Categories box to select Hikes or the Archives box to select a variety of months. Come hike with the group along the mighty Mississippi River’s west side, starting near the Franklin Avenue Bridge. Part of the 52 mile long Grand Rounds Scenic Byway, the paved trail has separate paths for bikers and hikers. Directions: From I-94, take the Riverside Ave. exit and proceed south on Riverside Ave. to Franklin Ave. Go east (left) on Franklin Ave. about three blocks to Seabury Ave. Meet on the corner of East Franklin Ave. and Seabury Ave. in Southeast Minneapolis. Join the group on the St. Paul side of the Mississippi River’s scenic gorge. We’ll head south from the Ford Dam Overlook parking lot on the paved trail high above the river. The leafless trees will allow great views of the river and the Minneapolis cliffside. Directions: From Hwy. 62, take Hwy. 5 going East (NE). Continue across the Mississippi River then immediately take the Shepard /River Road exit ramp. Continue curving right on the ramp, exiting onto Gannon Road. At the stop light turn right onto Mississippi River Road. Continue north on it for a couple miles to a long strip parking area labeled Ford Dam Scenic Overlook, just south of the Ford Parkway bridge. We’ll meet in the parking lot. Directions: From Hwy. 62, take Hwy. 5 going East (NE). Continue across the Mississippi River then immediately take the Shepard /River Road exit ramp. Continue curving right on the ramp, exiting onto Gannon Road. At the stoplight turn right onto Mississippi River Road. Continue north on it for a couple miles to a long strip parking area labeled Ford Dam Scenic Overlook, just south of the Ford Parkway bridge. We’ll meet in the parking lot. Join the hiking group for a turn or two around charming Como Lake, the largest public park in St. Paul. Como Lake was named in the 1840s by Charles Perry, who farmed a tract of land on the shore of the lake. Perhaps he was homesick as he named it for the famed Lake Como, in the Italian Alps where he grew up. Directions: From I-94 in St. Paul, exit onto Lexington Avenue & go north approximately 1.25 miles, past Minnehaha Avenue, to Como Park. Continue on Lexington Avenue as it winds through Como Park to the two parking lots for the Como Lakeside Pavilion at 1360 N. Lexington Parkway, one south & west of the pavilion near the fountain roundabout & one east & slightly north of the pavilion, closer to the golfing clubhouse. Park in either parking lot & meet in front of the pavilion. Join us on a beautiful Saturday hike along the Mississippi and Minnesota Rivers. From the paved trail we’ll see the river(s) on one side and the St. Peter Sandstone/Platteville Limestone/Glenville Shale rock formations on the other. Interpretive signs are located along the trail, as well. Be Aware: Spring snowmelt and water seeps from the rock outcrops mean some water pooling (1-3 inches) on a few spots of the trail. Waterproof footwear is advised. Directions: Take I-35E south to the Hwy. 13 exit. Turn left (east) onto Hyw. 13. Take Lilydale Rd., the first right after the overpass of 35E, down the hill. NOTE: There may be a sign stating ROAD CLOSED. ROAD OPEN UNTIL YACHT CLUB. Continue on past this, then 3/4 of the way down the hill take a left into the small trail parking lot. Come celebrate the end of the Polar Vortex (for now, anyway)! We’ll hike from the Visitor Center over hill and dale and around lakes and swales. The temps will be in the mid-30s with partly sunny skies. And, a pizza truck will be in the parking lot until 3 pm so what more could we ask for? Directions: Take I-35E south to the Cliff Road exit. Go east on Cliff Road 3.6 miles to the Lebanon Hills Regional Park entrance (at Hay Lake Road N. intersection), on the right (south) side. Follow the road to the Visitor Center & meet on the walkway just beyond the Visitor Center entrance door. Join us for a hike on St. Paul’s historic Summit Avenue from Ayd Mill Road westward. Summit Avenue in St. Paul is one of the best preserved upper-class Victorian promenade boulevards in America. The west end of Summit Avenue developed between 1890 and 1920. Structures include an assortment of Queen Ann, Romanesque, Beaux Arts, Georgian Revival, and Italian Villa styles. After the hike we’ll head to Green Mill Pizza on Grand Avenue, about a block from Kowalski’s, for socializing with food and drink. Directions: From I-94, take the Snelling Ave. exit & proceed South to Summit Ave. Go East (left) on Summit Ave. about ½ mile to Syndicate St. S. You can turn South (right) onto Syndicate & left into the large parking lot of Kowalski’s or park along the street. We’ll meet at the corner of Summit & Syndicate. Join the group for our last “regular” hike of the March-November season (but on Saturday afternoon, not Thursday night!). We’ll tramp above the scenic gorge of the Mississippi River (St. Paul side) heading south. The beautiful fall leaves are gone but we’ll be able to see the river and its narrow, deep gorge all the better for that on the lovely paved path. Directions: From I-94, on the western edge of St. Paul, take the Cretin/Vandalia exit & go south about 1.5 miles on Cretin Ave. to Summit Ave. Turn west (right) on Summit Ave. & continue to where Summit Ave. ends or “tees” into Mississippi River Blvd. On the southwest corner of the “tee” is Shadow Falls Park with a tall monument to locals who died in WWI & a small parking lot. Park in the lot or along Summit St. & meet at the edge of the parking lot toward the monument. Join the hiking group along the Trout Brook hiking/biking trail in St. Paul, another “rails to trails” trail development. Trout Brook was named after Trout Brook Estate, owned by lawyer and railroad president Edmund Rice. The waterway was a tributary to Phalen Creek, flows through St. Paul, and is the outlet of McCarron Lake. Directions: Take I-35E north out of downtown St. Paul to the Maryland Ave. exit. Go west (left) on Maryland about 1/2 mile & turn north (right) on Jackson St. Proceed on Jackson St. approx. 1/2 mile & turn west (left) on Arlington Ave. Go about 1/8th mile & park at the U. S. Post Office – Rice Street Station (40 Arlington Avenue East) parking lot, on the south side of the street. Take a hike with the group on the western corridor of Nine Mile Creek Regional Trail to mix scenic creek views with cityscape scenes. This 15.3- mile hiking and biking trail stretches from Hopkins to Richfield. Directions: We will meet at Hopkins Valley Park. From Highway 169 in the western suburbs, take the Excelsior Boulevard exit & proceed west to 11th Ave. Go south (left) on 11th Ave. to 7th St. Turn east (left) on 7th St. to 9th Ave. Go south (right) on 9th Ave. Hopkins Valley Park parking lot is on your left, just before Westbrooke Way. We’ll meet in the parking lot. Tag along with the group for a weekend fall color hike along the Mississippi River Gorge on the Winchell Trail. It’s a hidden gem, set into the hill below the busy Grand Rounds bikeway. The paved and unpaved trail hugs the hillside as it drops steeply to the Mississippi–very secluded and wild, perfect for our “Walk on the Wild Side” group. Directions: Take Highway 55 south from downtown Minneapolis, exit onto East 44th St. & turn east (left). Continue on it until West River Parkway. Turn left (north) onto the parkway. Then, in less than a block, turn into the first entrance on the right: a small parking area for park users. If no spaces are available, park along nearby streets like East 44th St. or Edmund Blvd. & walk back to the parking area where we’ll meet. Join the group for a hike on a “rails-to-trails” trail along the Mississippi River in South St. Paul. South St. Paul was once home to the largest stockyards in the world. Four major brands had meatpacking plants here, including Swift & Company and Armour & Company. World War II brought peak years to the industry when the plants had government contracts to supply military needs. By the l970’s, the market had decentralized and the sprawling plants became obsolete. The last to close was Armour in 1979. Directions: From I-94 towards the east end of downtown St. Paul, take Hwy. 52 exit south & cross over the Mississippi River to its south side. Take Concord St./Hwy. 56 exit & proceed south on Concord St./Hwy. 56 to northern South St. Paul. The trailhead parking is just past (south of) the Butler Ave. intersection, on the west side (right) of Concord St. and the pedestrian bridge spanning Concord Ave.
Come along with the group on a moderately paced hike at Edina’s Centennial Lakes Park, a man-made but quite lovely environment. Directions: From Interstate 494 in Bloomington, exit onto France Ave. Go north on France Ave. & turn right onto Parklawn Ave. Take the first left into the 7373 France Ave. S. building’s huge parking lot. You will see “West Elm” in bold type on the building at the north end of the lot. Park near that end (but don’t park against that wall as it is restricted) and we’ll walk down into the park together. Come along with us for a hike in Bloomington alongside scenic Nine Mile Creek. The paved & unpaved trail stays close to the creek & crosses over on several bridges allowing awesome views of the twists, turns & frequent rapids formed during its race to the Minnesota River. Fun Fact: Nine Mile Creek received its name from its distance measured southwest from Fort Snelling to where the Old Shakopee Trail crossed the creek. Directions: Take I-35W south from downtown Minneapolis to the West 106th St. exit in Bloomington, exit & go west (right) on West 106th St. At Morgan Ave. South turn north (right) & continue on Morgan Ave. South, past West 104th St to the Moir Park parking lot off Morgan Ave. where we’ll meet. Join the group for a hike from Hidden Falls south along the Mississippi River in the Highland Park section of St. Paul. The park is named for the small spring-fed waterfall trickling over a rock ledge in a secluded area of the park. Directions: From I-94 on St. Paul’s western edge, take Cretin/Vandalia exit & go south about 1.5 miles on Cretin Ave., then turn west (right) onto Randolph Ave. Proceed a few blocks then turn south (left) onto Mississippi River Blvd. & continue (under the Ford Avenue/46th Street Bridge, past the Ford plant), to the park entrance road on the right, Hidden Falls Drive, which is just before (north) Magoffin Avenue. This is the north gate to the park. Take Hidden Falls Drive down the hill to the parking lot & meet us by the picnic shelter, near the NE corner of the parking lot. Take an urban hike with us from Bryn Mawr Park under Highway 394 & along the trails of lovely Cedar Lake. The lake, about 170 acres & over 50 feet deep, is wrapped in greenery and offers iconic views of downtown. Directions: Take I-394 to Penn Ave. exit & go north on Penn Ave. about 100 feet to an immediate right turn, 8th Avenue SE. Turn right & park on the street as soon as you see Bryn Mawr Park. (If you miss the first turn, the second right turn, on Mount View Avenue, also works, with a right turn on Oliver Ave. South to come back to the park.) Meet by the first ball field in Bryn Mawr Park. Directions: Take Cty. Highway 62, exit onto Lyndale Ave. & go south on it. Take the first left turn (Lake Shore Drive) after the intersection with West 66th St. Proceed about 400 feet to the Nature Center (735 West Lake Shore Drive) on the south (left) side of the road. Meet by the gates to the Nature Center’s main entrance. Join the group for a hike along the Luce Line Trail, a “rails to trails” trail–63 miles from Plymouth to the small, west-central town of Cosmos. Originally built as the Electric Short Line Railway from downtown Minneapolis to west central Minnesota by Colonel William Luce, it was intended to capture the central Minnesota farm to market traffic and to provide transportation for people to downtown Minneapolis. Directions: The trail parking lot is in Plymouth, off of 10th Ave. N. & Vicksburg Lane. Take I-494 to Carlson Pkwy. Exit & briefly go west on Carlson Pkwy., then turn right on Gleason Lake Rd. Continue on Gleason for just over a mile & turn right on Vicksburg Lane. Continue on Vicksburg about ¾ mile. The entrance to Luce Line is on the left, at 10th Ave. At the Cimarron Ponds housing development, turn as if to go into the development, then veer to the left to the parking lot. Take a hike with the group along the many miles of varied parkland bordering Snail Lake in northern Ramsey County. Directions: Take I-35 E or I-35W to I-694 north of St. Paul to the Victoria Street exit. Proceed north on Victoria Street approximately 1/2 mile to 4191 Snail Lake Boulevard and turn east (right). Proceed on Snail Lake Boulevard to Snail Lake Park, on the north side of the road. Meet in the parking lot of Snail Lake Park. Note: There is a short stretch of this hike that is wet and muddy so wear appropriate footwear. Come with us for a hike through prairies and woodlands, past lakes and ponds in Lebanon Hills Regional Park’s glacial moraine landscape. We’ll view some of the Star Prairie being restored as well as woodlands around Portage Lake. The largest park in Dakota County, Lebanon Hills Regional Park is approximately 40% grassland. The remainder is wetlands and forests dominated by red oak. Flora and fauna are plentiful, including blazing stars, pileated woodpeckers and white-tailed deer. Directions: Take I-35E south to the Cliff Road exit. Go east on Cliff Road 3.6 miles to the Lebanon Hills Regional Park Visitor Center entrance, which will be on the right. Follow the road down to the Visitor Center and meet outside the Visitor Center near the parking lot. Come along with us through historic “Swede Hollow” in St. Paul along the southern portion of the Bruce Vento Regional Trail and into the Bruce Vento Nature Sanctuary. Early Swedish immigrant settlers named the valley “Svenska Dalen” or “Swede Hollow.” Subsequent Polish, Italian, and Hispanic immigrants moved into the squatter homes built along the sides of the ravine. In 1956, St. Paul Health Department officials “discovered” that Swede Hollow had no sewer or city water service. They declared it a health hazard, ordered the last 14 families to move out then destroyed the homes. Directions: From the West, go east on I-94 to downtown St. Paul’s East 7th Street Exit. After exiting, follow Wall Street a couple of blocks to East Seventh Street & go east (left.) Continue on East Seventh Street about nine blocks, past the Highway 52 bridge turnoff, to the trailhead, just past the intersection with Payne Avenue. From the East, take I-94 to the Mounds Boulevard exit. Continue on Mounds Boulevard to East Seventh Street & turn west (left.) Continue down the hill along East Seventh Street, a long city block to the trailhead. A small parking lot & the trailhead are on the south side of the street. Meet in the trailhead parking lot. Additional parking is available on the street on Payne Avenue. Join the group for a hike south along the Mississippi River from Hidden Falls in the Highland Park section of St. Paul. A secluded area of the park features a small spring-fed waterfall over a rock ledge. Directions: From I-94, on the western edge of St. Paul, take the Cretin/Vandalia exit. Go south about 1.5 miles on Cretin Ave. to Randolph Ave. & turn west (right). Proceed on Randolph a few blocks to Mississippi River Boulevard. Go south (left) on Mississippi River Boulevard, just past the Ford plant, to the park entrance, Hidden Falls Drive, just north of where Magoffin Avenue connects with the parkway. This is the north gate to the park. Take Hidden Falls Drive down the hill to the parking lot and meet by the picnic shelter, near the northeast corner of the parking lot. Let’s take an urban walk on the wild side around the environs of Minneapolis’ Boom Island Park. The hike route includes Nicollet Island and the James J. Hill bridge over the falls of St. Anthony. The route also passes by the outlet of Bassett Creek, Minneapolis’ best known subterranean stream. Directions: From downtown Minneapolis, take Washington Avenue north & turn right onto Plymouth Avenue. Go across the river on the Plymouth Avenue Bridge to Boom Island Park. Park in the Boom Island Park parking lot (a Minneapolis Park Board pay parking lot) or park without charge on the streets by the park such as Sibley Street NE or Ramsey Street NE. Come explore the Nature Center’s trails through woodlands, wetlands and prairies with us. In addition, there’s a farm with animals, garden fields, apiary, orchard and even raptors used in educational programs. Founded in 1967 by Olivia Irvine Dodge, Dodge Nature Center emphasizes environmental education for people of all ages, offering a great variety of nature-themed programs. Directions: From Hwy. 110 in Mendota Heights continue east & turn left (north) onto Delaware Ave. Turn right (east) onto Marie Ave., past an entrance sign for Dodge Nature Center, to Charlton St. Turn left (north) onto Charlton, past Dodge Preschool on the left, & turn into the next driveway entrance on the left: Dodge Nature Center Farm (1701 Charlton St.). Turn in & park in the lot, where we will meet. Let’s hike along Rice Creek in Fridley. Rice Creek flows through a series of lakes and marshes in southern Anoka and northern Ramsey counties, eventually joining the Mississippi near Fridley. Its drainage basin is in the southern portion of the Anoka Sand Plain, which was formed after the last glacier retreated from the region about 12,000 years ago. Directions: From I-694, take University Avenue exit and proceed north on University Avenue approximately 1.75 miles. Turn east on 69th Avenue exit but instead of taking a second right to 69th Avenue, continue straight on University Service Road. From University Service Road turn right (east) onto 71st Avenue. Follow 71st Avenue to end: a parking lot for Locke Park (840 71st Ave NE, Fridley MN). Meet in parking lot. Our hike through Minnehaha Park will begin on the scenic upper trail to pass the Longfellow House, Minnehaha Depot, historic John Stevens house and Minnehaha statue, then descend the trail to view the famous falls at several levels. We continue along both sides of Minnehaha Creek, crossing bridges several times while we travel down to the Mississippi River and back. Minnehaha Park’s 193 acres of natural bounty includes 53-foot Minnehaha Falls, limestone bluffs with creek and river overlooks, beautiful spring wildflowers and a variety of floodplain and upland deciduous trees such as oak, elm, silver maple, basswood, hackberry and cottonwood. Directions: From Hiawatha Avenue/MN Highway 55, south of downtown Minneapolis, proceed to 46th Street, turn east & just past the Holiday Gas Station, turn south onto the strip mall access road. Continue along the strip mall access road to the south end of the mall & park near Pet Supplies Plus. From there the group will hike a block south to the park. Come hike with us in Roseville’s largest park, beautiful Central Park. Roseville was settled by farmers in the 1840s. Roseville, Falcon Heights, Lauderdale, and part of St. Paul originally were part of Rose Township. How did it come to be called Rose Township? The township was named after Isaac Rose, who led the land survey the federal government ordered in 1850. Directions: From Highway 36 take Lexington Avenue north approximately 1/4 mile to County Road B2. Turn east (right) on County Road B2 and proceed east ½ mile to Victoria Street. Turn north (left) on Victoria Street and proceed ¼ mile to the park. There will be ball fields to the east (right) and a large parking lot to the west (left). We will meet in the large parking lot to the west. Join us for a hike around Pike Island, at the conjunction of the Mississippi and Minnesota rivers, in historic Fort Snelling State Park. Directions: From the West: Take Hwy 62/Crosstown Highway east to Highway 55, go south on Hwy 55 towards Mendota Bridge. Take “Fort Snelling Historic Sites” exit (between VA hospital & Mendota bridge). Follow signs to Fort Snelling Historic Sites & park in Fort Snelling Interpretive Center parking lot. Meet by river overlook near interpretive center. From the East: Head west across Fort Road/West Seventh Street/Highway 5 bridge from St. Paul’s Highland Park area & take Highway 55 exit north. Take “Fort Snelling Historic Sites” exit. Follow signs to Fort Snelling Historic Sites & park in Fort Snelling Interpretive Center parking lot. Meet by river overlook near interpretive center. Note: Fort Snelling Historic Site’s entrance is different from Fort Snelling State Park’s entrance off the Post Road exit from Highway 5, just west of the main terminal exit to the airport. 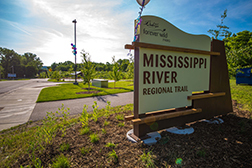 Come with us for a hike on a “rails-to-trails” trail along the Mississippi River in South St. Paul. Once, South St. Paul was home to the largest stockyards in the world. Meatpacking and related businesses became the heart of South St. Paul’s economy. World War II brought peak years to the industry but in the late 1960’s and 1970’s, the market decentralized and the sprawling plants became obsolete. Directions: From I-94, near downtown St. Paul’s eastern end, take Hwy 52 exit south over the Mississippi River. Turn onto Concord Street/Highway 56 exit and proceed south to the northern end of South St. Paul. About 100 yards south of Butler Avenue intersection is the trailhead, on the west side (right) of Concord Street, underneath the pedestrian bridge spanning Concord Avenue. This is prime season to hear the wonderful spring frog choruses! Come with us for a hike in Battle Creek Regional Park – East End. (Note: This is a different location than other Battle Creek hikes).There are several ponds and vernal pools in this section of the park, making ideal frog habitat! Directions: From I-94, take the McKnight Rd S. – South exit. Go south to Upper Afton Rd (4-way stop). Turn left (east) on Upper Afton Rd. to the park entrance on the left. (Note: This is the waterpark side – not the dog park, which is a right turn on the south side). This parking lot has a gate but is open until half an hour past sunset (8:29 on May 10), so we should be okay! Meet near the southwest corner of parking area. Directions: (Note: Due to construction around I-394 you may wish to consider ALTERNATE ROUTES, such as city streets or Hwy. 55 to Theodore Wirth Parkway.) Take I-394 West and exit at Penn Avenue, then go south to the Frontage Road. Proceed west and turn north (right) on Theodore Wirth Parkway. Proceed north to Glenwood Ave. Turn right onto Glenwood, then turn left into the Wirth Beach parking lot. We will meet at the Wirth Beach pavilion and walk the path to the wildflower garden’s back gate. Let’s hike in Arden Hills on a portion of the North Rice Creek Trail through the former Twin Cities Army Ammunition Plant/Arsenal area. The Twin Cities Army Ammunition Plant (TCAAP) was built as a self-contained community in 1941/1942 on four square miles of farmland to support the national defense. During World War II, the plant produced more than 4 billion rounds of ammunition and more than 10 billion rounds of ammunition for the Vietnam War. Directions: The group will meet at the County Road I parking lot of the Rice Creek trail, east of I-35W. Take I-35W North from Minneapolis, exit on County Road I, and go East (right). The parking lot is about 1/4 mile East of I-35W on the North side of the road. Join the group for a hike around Snelling Lake in Fort Snelling State Park. In 1819, Col. Henry Leavenworth and his troops spent the first three winters in a cantonment or barracks of log houses on the southeastern or Dakota County side of the Minnesota River called “St. Peter’s Cantonment” (also called “New Hope”). The troops moved into the fort in the late autumn of 1822. Prior to 1825, Fort Snelling was called “Fort St. Anthony,” alluding to the neighboring Falls of St. Anthony. Directions: From the west: Take Hwy 62/Crosstown Highway east to Highway 55, then proceed south on Hwy 55 towards the Mendota Bridge. Take the “Fort Snelling Historic Sites” exit (between the VA hospital and the Mendota bridge). Follow the signs to the Fort Snelling Historic Sites and park in the Fort Snelling Interpretive Center parking lot. Meet near the river overlook close by the interpretive center. From the east: Head west across the Fort Road/West Seventh Street/Highway 5 bridge from St. Paul’s Highland Park area and take the Highway 55 exit north. Take the “Fort Snelling Historic Sites” exit. Follow the signs to the Fort Snelling Historic Sites and park in the Fort Snelling Interpretive Center parking lot. Meet near the river overlook close by the interpretive center. Note: The Fort Snelling Historic Site entrance is different from the Fort Snelling State Park entrance which is off the Post Road exit from Highway 5, just west of the main terminal exit to the airport. Join the hiking group for a hike on Dakota County’s “Big Rivers Trail” along the Mississippi and Minnesota Rivers, on a late 1800’s rail bed converted to a hiking/biking/rollerblading trail. The trail is built on the rail bed of the Minnesota Central RailRoad, one of Minnesota’s oldest railroads. In 1857, the Minnesota Central RailRoad was incorporated by a special act of the Minnesota Territorial Legislature and was an early predecessor of the Milwaukee Road. Directions: Take I-35E from St. Paul across the Mississippi River. Exit at Highway 13. Take Highway 13 east (turn left) about 1/4 mile to the intersection with Lilydale Road and turn south (right) on Lilydale Road. Lilydale Road winds down a steep hill to the Pool & Yacht Club. Park in the trail parking lot, located off of Lilydale Road, just south of the railroad underpass, before reaching the Yacht Club. Join us for a hike along part of the 18-mile Gateway Trail, formerly a Soo Line (Minneapolis, St. Paul & Sault Ste. Marie RailRoad) rail line bed, that stretches from St. Paul to Stillwater. We’ll access the paved, multi-use trail from Maplewood’s Flicek Park. Directions: Take I-94 to I-35E in downtown St. Paul. Go north on I-35E to Larpenteur Ave/Wheelock Parkway exit. Proceed on frontage road to Larpenteur Ave, the 2nd street connected to the exit off-ramp. Turn east (right) on Larpenteur Ave. Continue on Larpenteur to Parkway Drive (the third stoplight after leaving freeway), then turn northeast (left) onto Parkway Drive. Parkway Drive becomes Frost Avenue after crossing Arcade Street/Highway 61 in Maplewood. Join the group for a hike around scenic Normandale Lake, just south of Highway 494. Join us for a hike along the Mississippi River bluffs in the Dayton’s Bluff area of St.
that originally included mounds from 200 BCE – 400 CE, as well as later Dakota Indian burials. Directions: Take I-94 east through downtown St. Paul to the Mounds Boulevard/Sixth Street exit. At the stoplight at the top of the exit ramp, go southeast (right) on Mounds Boulevard, proceed past 3rd Street and the I-94 overpass bridge. The Mounds Park overlook is two blocks beyond the overpass. Enter the parking lot on Cherry Street. Meet by the historical marker at the midpoint of the overlook. Join us for a hike within Lebanon Hills Regional Park’s glacial moraine landscape with almost 2,000 acres of woodlands, prairies, lakes and ponds. We’ll circle some lakes, check out the new shelter, talk easy tree ID and current park projects. to the Lebanon Hills Regional Park Visitor Center entrance (at the Hay Lake Road North intersection), which will be on the right. Follow the road to the Visitor Center and meet in the parking lot close to the Visitor Center. Join the group for a hike along the midsection of the scenic Gateway Trail in Maplewood and North St. Paul, in eastern Ramsey County. Directions: From Highway 36 east of I-35E, take White Bear Ave. exit. Go south on White Bear Avenue a few blocks to Maplewood Community Center (east side of road), 2100 White Bear Ave, just south of County Road B intersection. (If you’re driving south on White Bear Ave. and pass under a large pedestrian bridge, you’ve gone too far.) Meet at the south end of Community Center parking lot near Ramsey County Suburban Court building (2050 White Bear Ave). Come hike with the group along the west side of the Mississippi River below the University of Minnesota West Bank area and near the University’s Elmer L. Anderson Library. The University of Minnesota was founded as a preparatory school in 1851, seven years before Minnesota became a state, closed during the Civil War, and reopened in1867. It was established as a land-grant college under the federal Morrill Land-Grant Act, with land to use or sell to provide an education for students of all incomes. The Elmer L. Andersen Library is named for former State Senator and Governor Elmer Anderson, who donated his personal library of 12,500 rare volumes. It houses eight special collections and archives units. Directions: From I-94, take the Riverside Avenue exit and proceed south on Riverside Avenue to Franklin Avenue. Go east (left) on Franklin Avenue about three blocks to Seabury Avenue. Meet on the corner of East Franklin Avenue and Seabury Avenue in Southeast Minneapolis. Click the title above for a look at some of the hikes we lead almost every year.